What’s a fun family gathering without those tempting-looking mithai boxes with various kinds of sweets, all ready to be devoured? 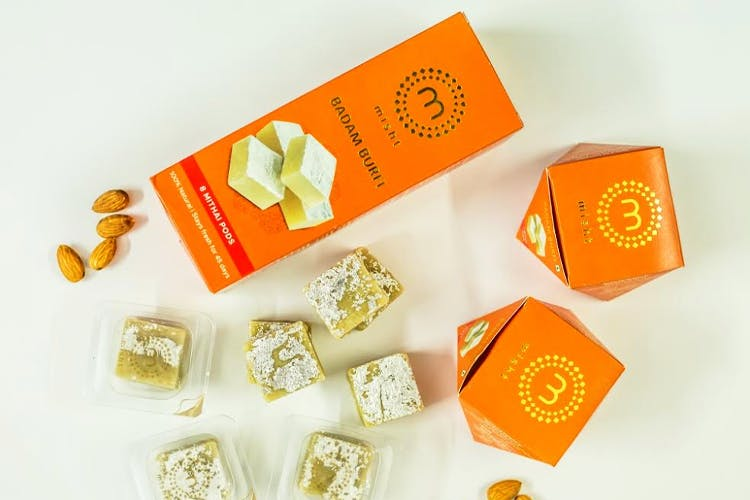 Make it better this time with Misht’s especially packed mithai gift boxes and put your loved ones’ sweetness cravings (and your gifting woes) to an end. Kaju Katli, Peda, Dodha Barfi, Milk Cake or Badam Burfi–how we’d love to make such sweet decisions all the time! With the festivities on, we’re so entitled to gorge on these treats without any guilt. So get these sweets for your friends, cousins, uncles, aunties and everyone else and spare the fake oohs and aahs with unnecessary gifts! These delicious sweets are individually packed in special pods and are simply indulgence in beautiful gift-able boxes. These are touted to be made with 100% natural ingredients without any preservatives or synthetic colours and flavours and these munchies can stay fresh for up to 45-60 days without refrigeration, so you’ll be remembered much after the occasion is over. The gift packs come in two different sizes of box of 2 and box of 8 and look really attractive. So take your pick from the customisable hampers this time as a convenient option. They’re also planning to soon launch more variants such as Chocolate ladoos and Chocolate Burfi and a few sugar-free versions for the diet-conscious ones. Save yourself the usual rounds to the neighbourhood halwai. All you gotta do is place your orders online for these premium Misht boxes, specifying the quantity, size and savouries and consider your gifting plans sorted. Know more about Misht on Facebook and Instagram.